Background: I will be a teaching assistant in a course on "Interactive Systems" with the following learning goals for the students. I will be teaching computer science students and students from a programme called "IT" which focuses on protoyping, programming, and design. Both groups are second year university students. Having recently graduated with a master's degree in computer science myself, I know from experience and from fellow students that courses on these topics are not appreciated (some loathe them to the point of bullying others for liking them). From speaking to the IT students, I know that they see these courses as simple, but essential to their further education. So I am, roughly speaking, standing with two groups of students: One that would rather be anywhere else on Earth, and one that thinks the course is fine. Now, as part of a course on teaching I have been asked to prepare a mini teaching session. I have decided on the goal for this session to be for the students to reflect on the role of interaction design and usability evaluations in a larger frame - for instance, what relations they have to database administration or to developers. I am hoping to motivate the students to see what their own future role could be, should they choose to go down that path, and otherwise to understand that it does play an important part along with the things that do interest them. My question is: Do you have suggestions for examples that I could provide them with, such as case studies of software development processes, or can you think of good arguments to put forth? Other comments are also very welcome! Edit: I am not just looking for examples of good/bad end results but also of the design/development process, to showcase e.g. how interaction design relates to programming/development. Get them hooked. Find interest for them. Give them some software, and real life items, that have poor user interaction. Have them use them, and then tell you and the class, what they think of them. What they would to to improve them. Doors with pull handles, and the word PUSH. Can you guess what people do? Some software bundled with a scanner that had only 3 features, compared with the 1000s in the competitors (want to be adobe) product. It was described as the most feature rich product in its class (it had 3 features, that worked, and were easy to use. That is 3 more than the competitors). Designing interfaces is boring for a programmer (it is the job of the artists). However “user interaction design” is not. User interaction design goes deeper, it is not about slapping an interface onto a poorly design think. It is about designing it from the ground up to be easy to use. Computer programming is about two things. The computer, and the humans. Most of the courses are about the computer. However we also learn high-level languages, and how to write programs that are easy to read and maintain (closer to the human). We also need to get closer to the users. By making it easier for them. From a database point of view. Imagine a database application with a simple elegant interface, easy to use, but no join. How imagine trying to find some info. Do a query, write the result to to some paper, do another query copying data from paper. However with joins, we don't need to do the remembering for the computer. Computers should not make us have to remember stuff. Computers are much better at remembering that we are. 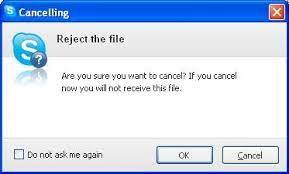 Which button do you press to cancel? Clue: it is not cancel. Types of easy: There are two types of easy to use: for the first-times / casual user; for the expert, that uses it regularly. Making it easy for the first-timer, will often make it harder for the expert (often having to work much harder, click, click, click). I train full stack development and that includes user interfaces (which falls under if not cover the entire gamut of interaction design). When it comes to examples, I talk about the infamous case of how Microsoft screwed up Windows 8. I use Windows 8 because a lot of people are familiar with it and may have actually used it. Or at least read about it. Or at least read about the many, many jokes made at windows 8's expense. You could use Windows 8 as an example how badly even a big company like Microsoft can screw things up, and the kind of impact it is going to have on users. Then, you can follow and reveal how Microsoft learnt from their own mistakes and fixed things with Windows 8. I always use this in my UI classes, and it elicits a lot of interest, familiarity and some fun stuff.It also seems to drive the point home. Not the answer you're looking for? Browse other questions tagged student-motivation gui or ask your own question. How can I maintain interest in front end? How do I scaffold students toward building meaningful projects? Uses of high school Computer Science: where can it lead other than university CS? What are good models for an Honors Program for CS students? What can the instructor do to overcome the Authenticity Bias in students? How do teachers motivate students to persevere and learn? How can we best inform potential students of the nature of CS?